Explore the hidden potential of your brain in this series of talks from leading neuroscientists and university professors. It is no exaggeration to say that the human brain is an impressive organ. With one hundred billion neurons and one hundred trillion connections, it’s the most complex structure in the known universe. But are you using yours it to its full potential? Or could increasing your understanding of the brain and how it functions enhance your everyday experience of reality? You'll leave with a better understanding of your mind, how it functions and get practical knowledge you can use to tap into its more of its hidden potential. Is creativity a gift or can it be trained? What is actually happening in the brain in those moments we are being truly creative? And is our current educational system repressing human beings’ innate curiosity and creativity? These are just some of the questions Professor Vincent Walsh will answer in this talk on the Neuroscience of Creativity. You’ll learn about the benefits of practising creativity, its effect on brain development over time, and how these insights can help you become more creative in everyday life – both personally and professionally. 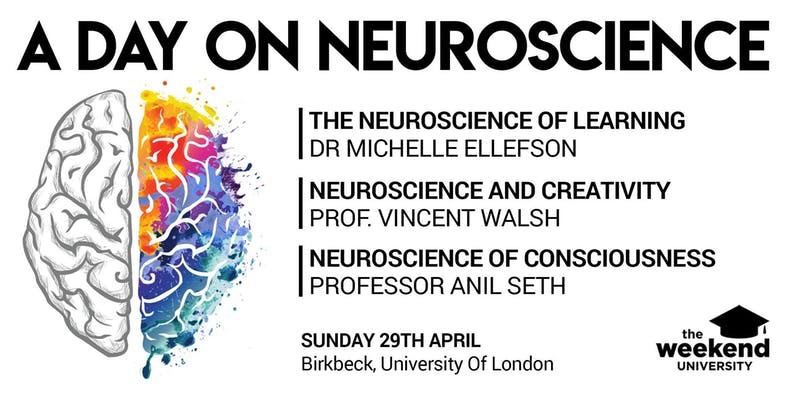 Professor Vincent Walsh is Professor of Human Brain Research and Royal Society Industry Research Fellow at the Institute of Cognitive Neuroscience, UCL. He specializes in taking science out into the real world, and works regularly with international rugby teams, elite level Team GB athletes, the Royal Marines, concert musicians, artists and business professionals. ‘Learning how to learn is life’s most important skill.’ Tony Buzan. This talk from a leading Cambridge Neuroscientist will show you how to tap into your hidden potential using discoveries from the neuroscience of learning. Whether you want to master a new language, learn a new skill, or ace an upcoming exam, developing an understanding of the science of learning is one of the most effective things you can do. The talk will explore the neural mechanisms involved in the learning process, how the brain processes and stores new information, and will conclude with practical strategies you can use to accelerate your own learning process. Dr. Michelle Ellefson is a senior lecturer in Psychology & Education at the University of Cambridge. Her work integrates cognition, neuroscience, child development, and education into a multi-disciplinary research, international research programme. Right now, billions of neurons in your brain are working together to generate your conscious experience. How does this happen? According to neuroscientist Anil Seth, we're all hallucinating all the time; when we agree about our hallucinations, we call it "reality." This talk will provide an insight into how consciousness emerges from the material brain, and how changes to our brain can result in bizarre experiences of consciousness. You'll learn about the latest research in the new science of consciousness and how cutting-edge experiments in neuroscience are shedding light on the underlying neural mechanisms that give us our conscious experience in normal life, as well as in neurological and psychiatric conditions. Anil Seth is professor of cognitive and computational neuroscience at the University of Sussex, and co-director of the Sackler centre for consciousness science. He is the co-author of the 30 Second Brain and contributes regularly to a variety of media including the New Scientist, The Guardian, and the BBC. His 2017 TED talk has been viewed more than 4 million times. The format will be similar to a TED event, but with in-depth lectures and focused on neuroscience.